This is the first of two parts looking at the Syria's struggle for independence. Both parts contain the introduction (above) and the SUMMARY OF SELECTED EVENTS to help readers see the whole sequence of events from the end of the Ottoman Empire to the current US Empire's proxy war against Syria. Over time the players change but it is the same game with the same goal: imperial powers and their oil/gas multinationals want no opposition to their plans. The sovereignty of Syria or any other country must be crushed. 1683 Battle of Vienna in which the forces of the Ottoman Empire were defeated by Holy Roman Empire of the German Nations in league with the Polish-Lithuanian Commonwealth. After this battle the Ottoman Turks took no more territory from the West. 1904 British Navy switches from coal to oil as fuel. 1914 British government takes 51% stake in Anglo-Persian Oil Company following discovery of oil in 1908. Eventually Anglo-Persian becomes part of BP. 1916 Britain and France agree to divide the territory of the Ottoman Empire in the Sykes-Picot Agreement, which creates the border between Iraq and Syria. 1918 Britain forces France to give up the oil-rich region of Mosul, declared part of Syria according to the Sykes-Picot Agreement in 1916, so it becomes part of British Iraq. 1920 Syrians declare an independent Kingdom of Syria in Damascus in March 1920. The French force Faysal ibn Husayn to abdicate and defeat Syrian forces at Maysalun. British make Faysal King of Iraq with a rigged plebiscite. 1925-1927 Sultan Al-Atrash leads a two-year revolt against France called the Great Syrian Revolution. Resistance ended in 1927 and Al-Atrash was forced to flee. 1927 British led Iraq Petroleum Company finds large deposit of oil in Kirkuk. 1928 National Bloc founded which united parties opposed to the French occupation of Syria. 1935 Iraq Petroleum Company completes Mosul–Haifa pipeline between the oil fields in Kirkuk through Jordan to Haifa. 1943 Shukri al-Quwatli, leader of the National Bloc, elected president of Syria. 1946 French evacuate their troops in April and Syria becomes an independent country. 1947 National Bloc splits into the republican National Party and the monarchist People's Party. 1948 Following the Israeli Declaration of Independence, Iraq closes the Mosul–Haifa pipeline and Syrian forces, with other Arab states, invade Palestine to remove Jewish settlements. Syria and others defeated in Arab-Israeli War. 1949 CIA organizes a coup to allow construction of the Trans-Arabian pipeline from Saudi Arabia to Lebanon passing through the Golan Heights. This removes the elected president. 1949 Second coup by officers wishing to unite Syria with Lebanon and Iraq. 1949-1954 In December 1949, Col. Adib Shishakli launches a third coup to stop a union with Iraq. He dissolved all political parties and outlawed all newspapers that were not pro-Shishakli. 1954-1958 The Arab Socialist Ba'ath Party with others helped to overthrow of Col. Shishakli. Elections were held and the three largest parties were People's Party, the Ba'ath Party and the National Party, led by the president, Shukri al-Quwatli. 1957 US and UK developed a plan to overthrow elected Syrian government. 1958-1961 Syria and Egypt unite as the United Arab Republic. In 1961 Abd al-Karim al-Nahlawi led a coup which ended the union with Egypt. The US/NATO drive to remove the Assad regime in Syria is the latest chapter in a story which began in the final years of the British Empire. The military power of the British Empire was based on the Royal Navy which had been powered by coal. Admiral John Fisher, Britain's First Sea Lord from 1904 to 1910, argued that even the largest ships in the Royal Navy should be powered by oil. Oil had many advantages as a fuel but it had one important disadvantage. Britain had a plentiful and cheap supply coal, but had no known domestic sources of oil. For hundreds of years what we know as the Middle East was under the control of the Ottoman Empire, which was probably the most powerful state in Europe when the Glorious Revolution took place in England in 1688. Eventually the countries in what we now know as modern Europe grew stronger. The defeat of Germany and its ally the Ottoman Empire in World War I played a central role in the historical background to the 100 year battle for control of Middle East oil. 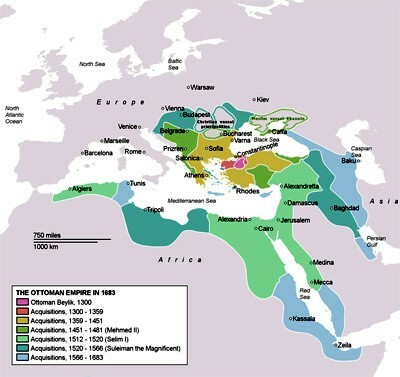 The most important development was that most of the land held by the Ottoman Empire was removed from its control by the victorious British Empire and the French. Syria represented the largest Arab state to emerge from the formerly Ottoman-ruled Arab Levant. In 1916, well before the war ended in a victory for Britain and France, two diplomats, Frenchman François Georges-Picot and Briton Mark Sykes, secretly agreed on the post-war division of the Ottoman Empire into respective zones of influence in what is called the Sykes-Picot Agreement. What became known as Syria was taken by France, while what has become known as Iraq was taken by Britain. Initially, the two territories were separated by a border that ran in an almost straight line from Jordan to Iran. However the discovery of oil in the region of Mosul just before the end of the war led to yet another negotiation with France in 1918 in which they were forced to cede this region to the British zone of influence. Shukri al-Quwatli (1891-1967) was born in Damascus and began his political life as a dissident working towards the independence and unity of the Arab territories in the Ottoman Empire. He was imprisoned and tortured for his activism by the Ottomans. While the British and French were deciding how to divide the Ottoman Empire between themselves, the Syrians had some plans of their own. British-supported Hejazi forces defeated the forces of the Ottoman Empire and captured Damascus on 30 September 1918. An independent Kingdom of Syria was proclaimed in Damascus on 8 March 1920, with Faysal ibn Husayn (Faysal I) of the House of Hashim as its king. Hashim al-Atassi, a member of the landowning and politically active Atassi family, became prime minister during this short-lived period. 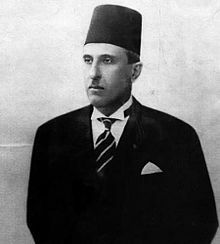 When the Kingdom of Syria was established in 1920 Shukri al-Quwatli was opposed to the Syrian Monarchy and helped to found the republican Independence Party. Quwatli was immediately sentenced to death by the French who took control over Syria in 1920 but he managed to escape to Egypt. From there he helped to finance the Great Syrian Revolution which lasted from 1925 to 1927. In 1925, Sultan al-Atrash led a second revolt which broke out in the Druze Mountain and spread to engulf the whole of Syria and parts of Lebanon. It took the form of a general uprising across Syria and Lebanon with the goal of getting rid of the French. It was not centrally-coordinated but many minorities took part, including Sunni, Druze, Alawite, Christian, and Shia. (4) Al-Atrash won several battles against the French, however France sent thousands of troops from Morocco and Senegal, leading the French to regain many cities. Resistance lasted until the spring of 1927 and Al-Atrash was forced to flee from Syria. 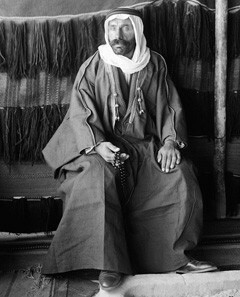 Arab Druze leader, Syrian nationalist and Commander General of the Syrian Revolution (1925–27). Not to be confused with T.E. Laurence, an army intelligence officer for the British Empire. The National Bloc was founded in 1928. It was a coalition of parties hostile to the French presence in Syria. The Bloc was led by land owners and lawyers, including the fifty richest families of Syria. In 1930, the French pardoned Quwatli. He was allowed to return to Syria, where he became a principal leader of the National Bloc. After the dissolution of the Ottoman Empire, the three provinces of Ottoman Iraq came under British occupation authorized by the League of Nations at the San Remo conference. As in Syria, the people of Iraq did not accept British rule and rebelled. In order to establish a pro-British client regime, a dynasty of Hashemite kings from Saudi Arabia was established, beginning with Faisal I, who had been briefly King of the Arab Kingdom of Syria in 1920. The British Government appointed the House of Hashim as Iraq's royal family after a rigged plebiscite, but they were never accepted by a majority of the population. In 1936 Syria and France negotiated a treaty of independence, and Hashim al-Atassi returned the to be the first president of the Republic of Syria. However, the treaty never came into force because the French Legislature refused to ratify it. With the fall of France in 1940 during World War II, Syria was claimed by Vichy France, but in 1941 British and Free French defeated the Vichy forces. In May 1948, Syrian forces invaded Palestine, together with other Arab states, and immediately attacked Jewish settlements. The president Shukri al-Quwatli, instructed his troops in the front to destroy the Zionists. The invasion's goal was prevention of the establishment of the State of Israel. Syrian defeat in the Arab-Israeli War was one of factors for a coup in March 1949 led by the Syrian Army chief of staff at the time, Husni al-Za'im. The coup was carried out with the backing of the US by the newly formed Central Intelligence Agency. The US action was taken to facilitate the construction of the Trans-Arabian Pipeline, which the government of Syria had blocked. This project was immediately ratified following the coup. 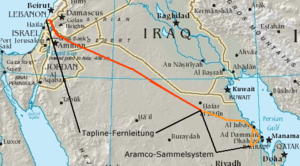 (9) Notice that the Trans-Arabian pipeline was a replacement for the Mosul-Haifa Pipeline closed by Iraq after the Arab-Israeli War and would have supplied oil to Israel. Only months after al-Za'im's takeover, he was overthrown by a group of officers including General Sami al-Hinnawi. He was a friend of the new People's Party and an ally of the Hashemite royals in Baghdad. Other officers involved in the coup were connected to the Syrian Social Nationalist Party (SSNP). The SSNP is a left-wing secular-nationalist political party with supporters in Lebanon, Syria, Jordan, Iraq, and Palestine. It advocates the establishment of a Syrian nation state spanning the Fertile Crescent, including present day Syria, Lebanon, Iraq, Kuwait, Jordan, Israel, Palestine, Cyprus, and Sinai. Its program is to create a new state based on geographical boundaries and the common history people rather then the arbitrary borders imposed on the territory of the former Ottoman Empire by the British and French. Hashem al-Atassi, another friend of the People's Party, was appointed by Sami al-Hinnawi to be prime minister appointed. He also wanted to create a union with Hashemite Iraq in line with the policy of the People's Party and the SSNP. However in December 1949, Col. Adib Shishakli launched a coup to block any ideas of a union with Iraq. The first period of independence and parliamentary rule ended in 1949 with the CIA coup that removed president Shukri al-Quwatli, leader of the new National Party. The People's Party coup which removed Husni al-Za'im was in turn replaced by the more conservative regime of Colonel Adib Shishakli. He was hostile to Israel but aimed for friendly relations with the West. He had been commissioned as an officer in the French Syrian Army in 1930. Not long after Shishakli took power, he dissolved all political parties and outlawed all newspapers that were not pro-Shishakli. Among those to suffer persecution were the National Party of Damascus, the People's Party of Aleppo, the Communist Party, the Baath Party, and the Syrian Muslim Brotherhood. The National Bloc, created in 1928 to bring independence to Syria, was disbanded in 1947 after it was achieved. It broke into two different parties: the National Party, led by Shukri al-Quwatli was based in Damascus, and the People's Party, led by Rushdie Kikhia and Nazim al-Qudsi, based in Aleppo. In 1947, al-Quwatli and the National Party were the largest party in parliament. One of the significant areas of difference between these two parties was their stand on the desirability of uniting Syria with Lebanon and Iraq. The Hashemite kings of Iraq and Jordan, Abdullah I and Faisal II, respectively, wanted to unite Syria, Iraq and Jordan under Hashemite monarchical rule, while al-Quwatli proposed that Iraq and Jordan join a republican Syria under his leadership. In 1952 Adib Shishakli established an official government party, the Arab Liberation Movement, but it was not well received and it was boycotted by powerful representatives of civilian political society, such as Hashim al-Atassi. Leading the anti-Shishakli movement were former President Atassi and the veteran Druze leader Sultan al-Atrash. Growing discontent eventually led to another coup, in which Shishakli was overthrown in February 1954. The plotters included members of the Syrian Communist Party, Druze officers, and Ba'ath Party members. According to an article in the Guardian, the "conservative military regime of Colonel Adib Shishakli" was overthrown in 1954 by an alliance of Ba'ath party and Communist party politicians and their allies in the Syrian army. (11) However according to an article in "The Western Political Quarterly" Syria had two four-year periods of parliamentary rule, from 1945 to 1949 and from 1954 to 1958. (12) Clearly it was the coup by Husni al-Za'im and the CIA which terminated the first period of parliamentary rule by overthrowing president Shukri al-Quwwatli of the National Party. 12. Amos Perlmutter, "From Obscurity to Rule: The Syrian Army and the Ba'th Party", The Western Political Quarterly, Vol. 22, No. 4 (Dec., 1969), pp. 827-845.